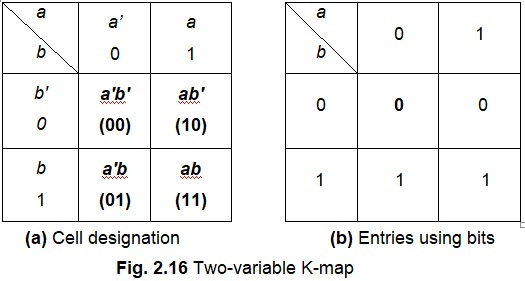 Figure 2.16(a) shows a two-variable K-map. This is a square with four cells in it. The variables are entered on the map, as shown in the figure. It can be seen that each cell represents a particular minterm (or maxterm). 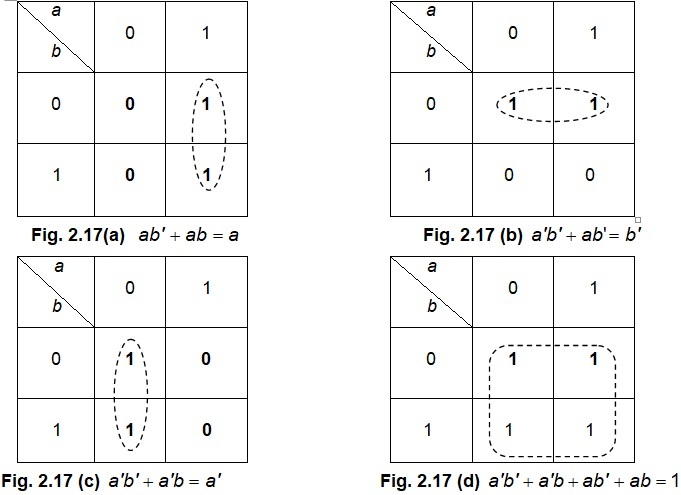 For example, top cell on the left represents the minterm a'b' (≡00), the top cell on the right represents a'b (≡01), the left cell on the bottom represents ab' (≡10), and the right cell on the bottom represents ab (≡11). An entry in a particular cell represents the presence (or, absence) of the corresponding minterm. This is illustrated in Fig. 2.16(b). The 1s in cells 01 and 11 indicate that the minterms a'b and ab, respectively, are present in the SOP expression. The 0s entered in cells 00 and 10 represent the absence of the minterms a'b' and ab', respectively, in the SOP expression. Figure 2.17(a) shows the pairing of variable b and its complement b’. This pairing eliminates the variable b. The variables b and b’ are said to form a pair. We find similar pairs in Figs. 2.17(b), and 2.17(c), where variables a, and a’ are, respectively, eliminated. In Fig. 2.17(d), however, we find that we can pair all the four variables; this results in the elimination of both the variables a and b, as illustrated in the figure. 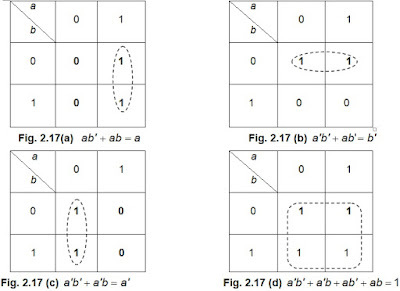 The grouping of four variables is called a quad (the author prefers to call this as a quartet, in similarity to the term octet, which represents the grouping eight variables).